This would be extremely useful so I don't have to switch back and forth between profiles to check what I bound baseline spells and UI functions to. left- or rightclick rebinds on 3D models (hovercast) do nothing. same with removing the default click target/menu bindings. no effect whatsoever. shift-click bindings do work, though. Clique is at the moment clashing with ElvUI I think, because my spell hovercasts only work for the initial spec that my clique was set for, but every time i switch to another spec my spells stop working. No error, nothing, spells are just non-interactive. If I switch spec I also have to disable clique...Not sure if this is ElvUI problem or Clique. I am having the same issue. Did you find out if there was a clash or something? Maybe I'm missing it, but is there a tooltip feature which, when you, for example, hover over a character's nameplate, it reminds you of the Clique bindings you have set, showing friend and enemy accordingly if set? If not, is that something you'd consider adding as an option? Is it possible to deactivate Clique while in a vehicle? Getting a non-disruptive LUA error (doesn't seem to break functionality - just shows up out-of-combat). Happens whenever I interact with a friendly NPC (quest giver, flight master, etc). Left click target and right click interact throw the same message. 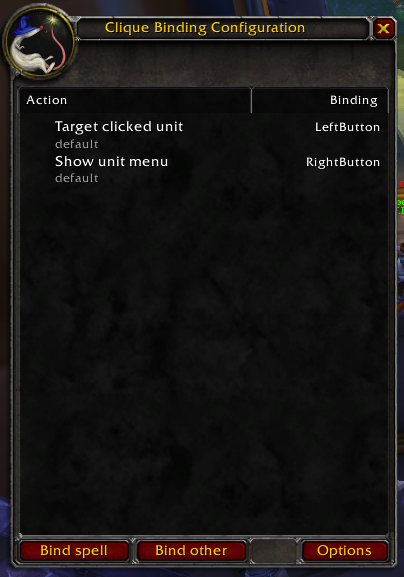 I wish this addon would work when my cursor is on the buff/debuff icons in the default Blizzard raid frame. When my mouse position is on the buff icon, none of the Clique binding works except the left and right mouse button. It makes it inconvenient when playing restoration druid that the buff icons takes some space in the raid frame. There is a chance that my spell is not casting or casting to the wrong person if I place my mouse on the buff icon instead of the center of the frame. Having an issue suddenly where my hovercast spells on party and unit frames will work for the initial hover but casting a second spell triggers the key binding for the action bar, almost like it's not recognizing that i'm still hovered over the unit/raid frame. clicking off the unit/raid frame and re-hovering allows for casting a new spell but same issue happens when attempting to cast 2 consecutive spells on hover. I'm a very new user of Clique and I use it on my Mage so excuse me if this has been answered before. I am currently using it by binding some fire damage spells to left, right and middle click on my mouse. The spells are fired off when clicking on a parties target unit frame. This seems to work fine but I have noticed it doesn't actually "target" the enemy, that is although the spells are hitting their intended target I don't seem to be targeting the enemy or have focus. Consequently when I use a spell outside of the bindings, for example one on my actionbar, it fails because WoW complains it doesn't have a target. I hope this makes sense I don't know how to explain it any better. What I am really asking is how can I target the enemy and cast a spell by clicking on a party members target unit frame. That's by design, as indicated in-game and in the documentation for the addons. Hovercast and global bindings are always active. nothing happens (when i ctrl+rightclick), spells do not cast, no error message or anything. i now started to use different profiles for different specs (instead of using multi-spec bindings), it works fine this way. Yes, but what doesn't work? Can you be specific?